Photographs courtesy F. A. Bartlett Tree Expert Co. Most structural defects that occur in older trees can be prevented by pruning when the tree is young. This practice can avoid the need for more expensive tree care practices later in the life of the plant and can extend the lifespan of the tree by decreasing the likelihood of branch failures. Structural pruning of young, developing trees provides a desirable and stable form at maturity and is one of the best investments that consumers can make in their landscape. Forest trees tend to develop a sound structure in response to competition. They grow in close proximity to other trees and the shade created by the developing forest canopy suppresses growth of lower limbs. Dominant forest trees tend to maintain a single stem and narrow crown as they grow toward light. This produces a reasonably strong structure in mature forest trees. Conditions are radically different when trees are planted in the landscape. The tree is exposed to full sun, which encourages a broader, more complex crown than one growing in the forest. Lower branches may grow very large, limbs develop in close proximity to one another and multiple stems can develop. Certain species such as maple, elm, ash and dogwood are particularly prone to developing structural defects. When trees are young, they grow rapidly so frequent assessment is recommended to determine when pruning is needed to maintain a desirable structure and correct any deficiencies. On many species, pruning is needed every two-to-three years for the first ten-to-fifteen years after planting. 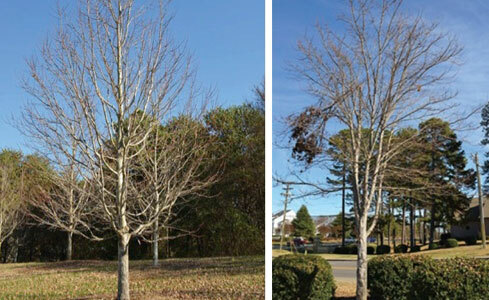 Structural pruning focuses on maintaining a single dominant stem unless multiple stems are specifically desired as is frequently the case in some species such as birch and crapemyrtle. Branches are pruned so their size remains proportional to the stem diameter at their point of attachment. As trees grow, some branches are removed to ensure adequate spacing between permanent scaffold limbs. The shape of the tree is maintained to provide a natural open grown form typical of the species. Examples of a young maple tree that has been structural pruned (left) and another young maple without pruning (right). Note: This article first appeared in THE F. A. BARTLETT TREE EXPERT COMPANY Newsletter, SE Tree Tips-Winter 2013. Reprinted here with permission.